It’s Spotlight Saturday time again. 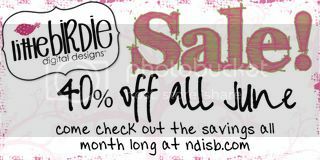 I hope you’re enjoying our month with Little Birdie Digital Designs. This week Sarah is going to share a little bit about her designing process. I will have been designing for about a year this summer. Although I can’t believe that is true as I still have so many ideas that haven’t made it off the paper! Kids and life will do that. I got into designing as a natural progression of my scrapbooking. I started digital scrapbooking in 2008 and slowly learned more and more. By late 2010 I had more time to devote to my hobby and was really getting into it. And then I started thinking, hey I can do some of this and some of that, and have things just as I want them. So I began learning how to create papers and elements and the progression has continued since then. As a new designer I’m constantly learning and trying new things. I wish I had much more time to devote to it, but, for now, I’ll just have to keep my to-do list running! Would you say you have a certain style as a designer? Not exactly. I like to try all different types of styles but I do know that I’m a bit more grungy than I am clean and simple. I like the paper to have a bit of a textured and worn look to it so it creates an interesting background for layouts. Really anything but especially color. I’m always looking at things thinking, hey, that goes well together and it will spark an idea for a kit. Papers! I love papers! Elements are great too but I tend to love using papers. I think this is from my old days of scrapping where I used to just have paper and a limited supply of elements. I liked to create my own elements at that time and still do. Well, I’ve got my DSLR camera to help me take great pictures and find interesting textures to use in my design work. You wouldn’t believe the things I’ve used to turn into a brush to distress some paper with! Ok, I’ll give you a little insight – my dog’s fur! Other than that I’ve got an HP and love my Wacom Bamboo tablet – which I couldn’t scrap without either. 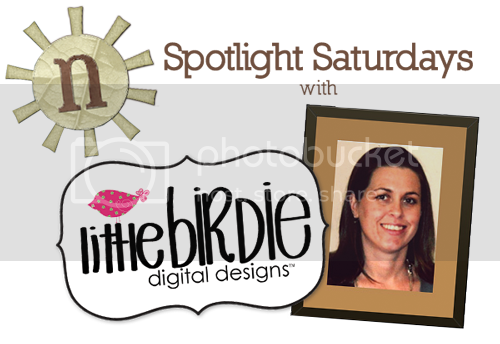 Have you caught the latest from Little Birdie Digital Designs? Sarah’s got a new, super fun beach themed kit out, and another set of awesome Clip.It Accents. Check them and the rest of her store out, 40% off for the whole month of June!